The Meeting was held at St Edburg’s Church Hall, Bicester. Seventy members and fifteen guests were present at the meeting. Pete Chivers introduced Bob Hessian whose talk centred on recent local digs and Bicester Priory. Bob outlined a history of the Roman Invasions of Britain and the subsequent development of Alchester lying two miles to the south of the present town of Bicester. The departure of the Romans in the early fifth century saw an eventual move of the town to a new, drier site at Bicester. The foundation of the Saxon Minster provided an impetus for growth in the settlement. No evidence remains on the original Saxon Church except possibly an arch in the present Parish Church of St Edburg. 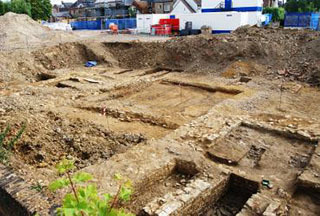 Evidence of early Christian practices was uncovered with the discovery of a Saxon cemetery whilst the car park to the Roman Catholic Church was being laid in 2000. Several skeletons, orientated on an east – west alignment, were noted. 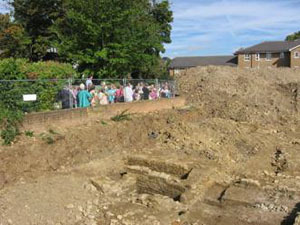 The construction of the new Catholic Community Centre in 2011 provided archaeologists with an opportunity to excavate the site. The bones, predominantly female, were dated to a time around 640 A.D. The skeletons were re-buried in the Church’s Memorial Gardens in October 2011. Bicester Priory was founded by Gilbert Bassett in 1182. It was one of a series of Augustinian houses in the Oxfordshire area. The site of the Priory housed eleven monks and a Prior and was situated on land adjoining the Manor House of Gilbert Bassett. Bicester Prior was small and poorly funded. King Henry VIII is recorded as visiting the Priory shortly before it was dissolved in 1536. Excavations have taken place at the Priory by John Dunkin (1819), David Watts (1964 – 1969), David Hinton (1968) and John Moore Associates (2011). Little remains of the original Priory but excavations and written accounts have provided a picture of the Priory and what life was like for those who lived and worked there. The present dovecote superseded an original structure and stable buildings survived until they were destroyed by fire in 1960s. The main entrance to the Priory was a gatehouse situated in Church Lane. 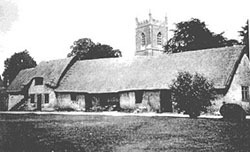 The site contained a large Priory Church that was much bigger than the present Parish Church and included cloisters, mills, domestic buildings, guest house and farm buildings. 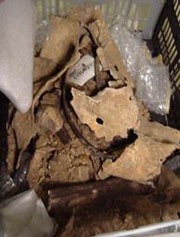 A number of skeletons were found on the site. Pilgrims visited the Shrine of St Edburg. 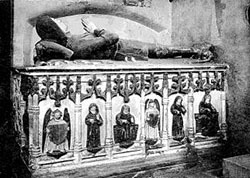 This was removed when the Priory was demolished and can now be found at Stanton Harcourt Church. The Shrine was finely decorated and was believed to have displayed a reliquary containing the bones of St Edburg, a Saxon princess. The Shrine was thought to have been designed by Alexander of Abingdon in the early fourteenth century. 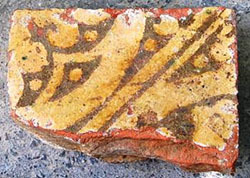 Recent excavations (2011) uncovered a lead reliquary containing bones on the former site of Bryan House adjoining Priory Lane. Foundations of the Priory Church were uncovered and twenty skeletons in or close to the Nave area. An analysis of the date of the bones should prove interesting as to dating the reliquary. Bob answered questions at the completion of his talk. The Meeting closed at 9.04 p.m.